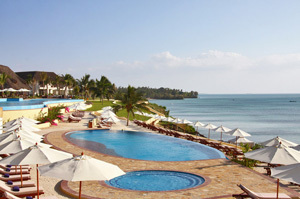 Sea Cliff Resort & Spa is a beautiful 120 room resort located on the West Coast of Zanzibar. Conveniently located 20 minutes from the famous world heritage site of StoneTown, Sea Cliff is the perfect escape for those wishing to combine relaxation with culture. With traditional ‘makuti’ thatched roofs and brass lit Arabic towers the hotel is designed to mirror the influences and aesthetics of its surrounding location. It is a unique combination of modern facilities encased in the original architecture of historical Zanzibar. The hotel takes its name from the cliff upon which it is situated overlooking the Indian Ocean and offers breath taking panoramic views from the lounge, restaurant, bar and recreation areas. The hotel’s two infinity swimming pools offer the perfect place for guests to absorb the true splendor and beauty of the coast. The west coast of Zanzibar is infamous for its spectacular sunsets which rival any other across the globe. The long, stretching jetty is the perfect place to enjoy a sundowner or guests can sail on Sea Cliff’s very own traditional dhow and watch incredible sunsets in an authentic and romantic atmosphere. 96 of the rooms offer ocean views from the bedrooms and private balconies and are all equipped with modern facilities including wireless internet throughout the property and iPod docking stations on request. The hotel offers a number of activities for the more energetic guests, including a fully equipped gym, water sports centre, two tennis courts, a squash court and even bicycles for rides through the coconut plantations. For those not so energetic, we have numerous board games available from the recreation centre and not forgetting the supervised ‘Kids’ Club’ which has its own playground, climbing wall, arts & crafts, activities and Cartoon Network. Our professionally managed stables offer riders of all levels the opportunity to ride through breathtaking scenery, including along the beach at sunset. Zanzibar’s very first signature golf course is in the process of being landscaped and will be ‘teeing off’ mid December 2014. A clubhouse on the private beach completes this magnificent course. The course is designed by Award Winning designer, Peter Matkovich and will be a 71 par, 9 hole, 18 tee course. For guests wanting to relax and be pampered, there is the indulgent Shwari Spa. With five treatment rooms the spa offers a range of services including manicures, pedicures, facials and massages. All our treatments are provided by internationally trained therapists. There are also two steam rooms and two saunas so guests can truly unwind during their stay at Sea Cliff. 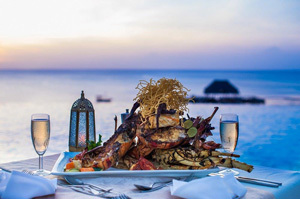 Zanzibar is a unique destination filled with history and character, all of which can be experienced from this enchanting resort and its wonderful staff. Sea Cliff Resort & Spa is the perfect place. 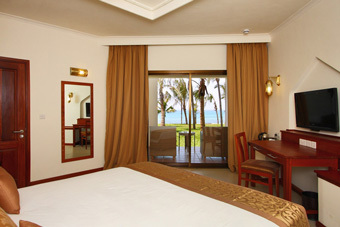 For further information visit www.seacliffzanzibar.com.